You may have noticed some new signage at Prairie Spirit Trail rest stops. Stainless steel sign posts began appearing earlier this year, and informational placards have now been added. The placards contain photos and text describing interesting plants and animals to be found along the trail. 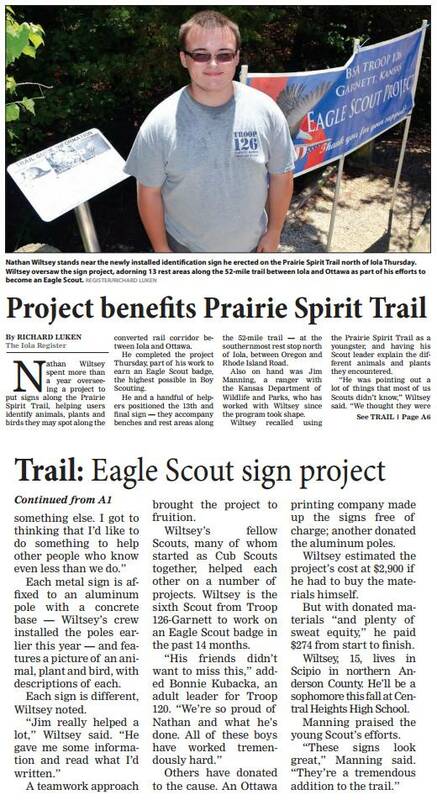 The signs are an Eagle Scout project from Scipio resident Nathan Wiltsey, who initiated the project, organized the tasks, secured the funding, and worked to install the posts and signs, along with other Boy Scout volunteers, and Kansas Department of Wildlife, Parks, and Tourism ranger, Jim Manning. 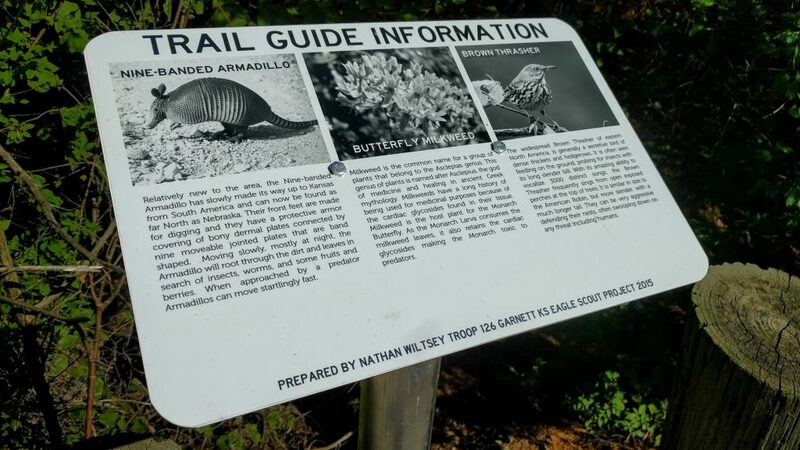 Nathan Wiltsey spent more than a year overseeing a project to put signs along the Prairie Spirit Trail, helping users identify animals, plants and birds they may spot along the converted rail corridor between Iola and Ottawa. He completed the project Thursday, part of his work to earn an Eagle Scout badge, the highest possible in Boy Scouting. He and a handful of helpers positioned the 13th and final sign — they accompany benches and rest areas along the 52-mile trail — at the southernmost rest stop north of Iola, between Oregon and Rhode Island Road. Each metal sign is affixed to an aluminum pole with a concrete base — Wiltsey’s crew installed the poles earlier this year — and features a picture of an animal, plant and bird, with descriptions of each.